Erected by direction of the late Neil McKay Esq. Albion Mines Pictou, N. S. in memory of his father. John McKay farmer of Egnal died 30th December 1846 aged 78. Wife Margaret McKay died at Mid Clyth 12th August 1862 aged 91. 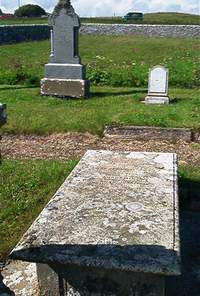 Daughter Euphemie McKay died at Mid Clyth 5th December 1881 aged 80 wife of the late Peter Robertson teacher of Stroma.